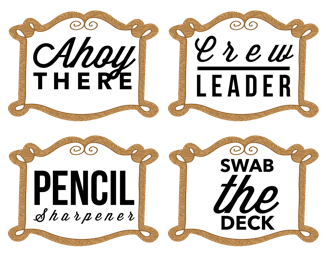 Buy these awesome pirate themed name tags (fits in an Avery template label holder- 2945) to have the students wear their job for the day or week. These print and fit into a plastic badge holder perfectly. Visit my TPT site to download them today! You can also just cut them out and laminate them to have on the board. If you think of any other jobs you would like after buying, please email me, and I will send them to you for FREE. Thank you!